¿Cuantos mensajes puedo recibir de los usuarios del blog a travez de mi formulario con la cuenta gratis? 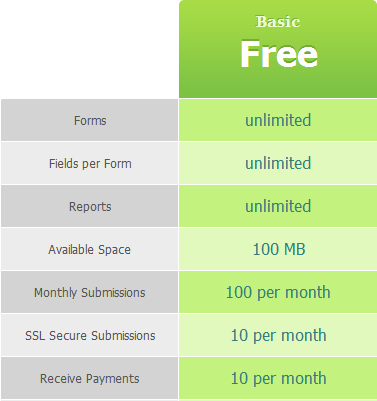 Free users are limited up to 100 Submissions per month, 10 SSL Submissions and 10 for Payment Submissions. When you passed one of these limits, your forms will be temporarily disabled. You can upgrade to one of your paid plans to enable it back or you have to wait the monthly submissions reset period which is every first day of the following month. For example, next reset will be on July 01, 2012. Hope this information helps. Please let us know if you any other questions. Thanks!